They have launched 'Dip Your Own' asparagus where you can dip the best of British asparagus into a pot of delicious home-made Hollandaise sauce, grated egg and Parmesan. Soft, free-range egg combined with the slightly sharp, nutty taste of Parmesan and a classic Hollandaise make for a fantastic flavour combination given a new twist – and everything comes on your own individual board so all you have to do is dip, and enjoy. Food and drink gifts are the perfect solution to Father's Day gift dilemmas and a foodie gift experience or workshop provides an extra wow factor. Join him for quality father & child bonding time, or give him a uniquely delicious gift that will create memories, skills and knowledge to last a lifetime. 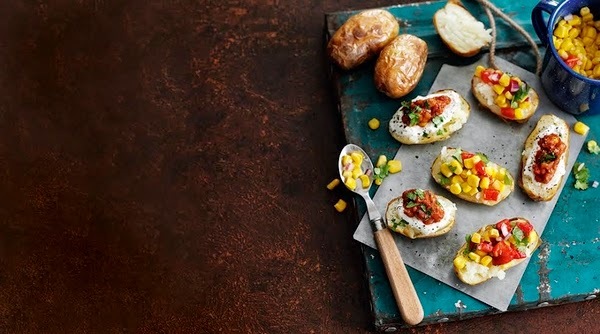 Here are ten of our favourite Father's Day Food Experiences. Calling all new food and drink artisans - the train to success is now waiting at Old Street Station! 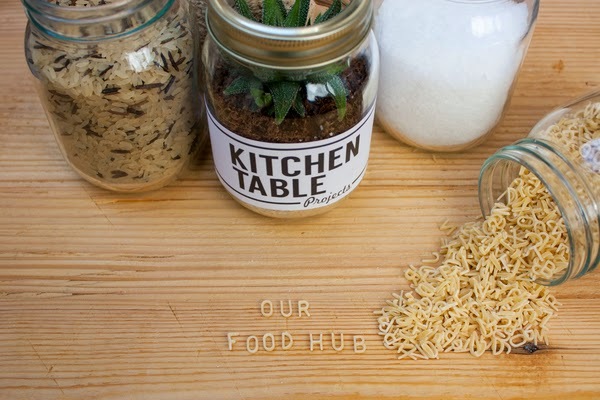 Kitchen Table Projects are launching a unique platform for emerging businesses who are looking to take their product to the next destination. Be one of fifteen very special artisans to take part in the first ever School of Food - and secure a ticket to showcase your product to thousands of shoppers and commuters at Old Street Station, right in the heart of London's start up scene. Or be a visitor and experience the top fifteen new products this summer from June 22nd until September 13th. 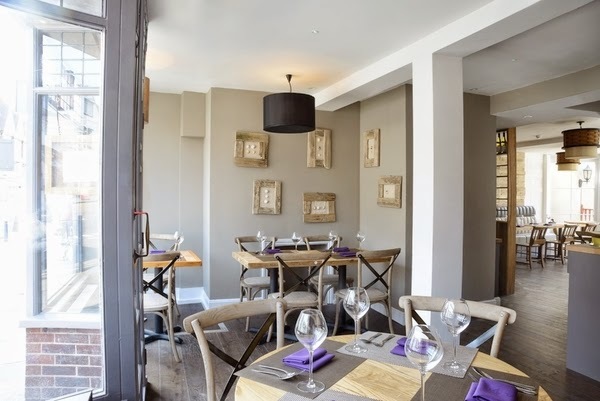 As part of the celebrations to mark English Wine Week (23rd May - Sunday 31st May 2015) Saltwood on the Green restaurant, near Hythe on the south Kent coast, is to host a special gourmet Wild food & Kentish wineevening on Tuesday 26th May, with Biddenden Vineyard. English Wine Week is a national campaign, designed to raise awareness of English wine across the country through retail outlets, including supermarkets, independent wine merchants, delicatessens, hotels, pubs, bars and restaurants. Vineyards across the country will also be opening their doors to welcome visitors, offering tours, tastings and special offers. The special gourmet evening begins with a welcome Saltwood Spritz aperitif – with dandelion and burdock. 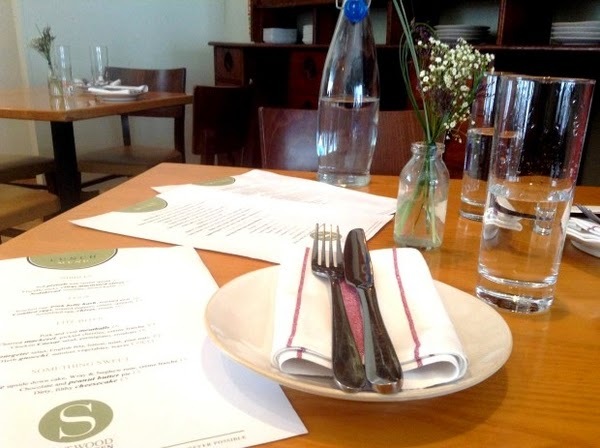 The first course will be a Bittercress pannacotta, slow-cooked egg, cured meats, wild-leaf salad and will be accompanied by Bidenden's Bacchus, 2013. 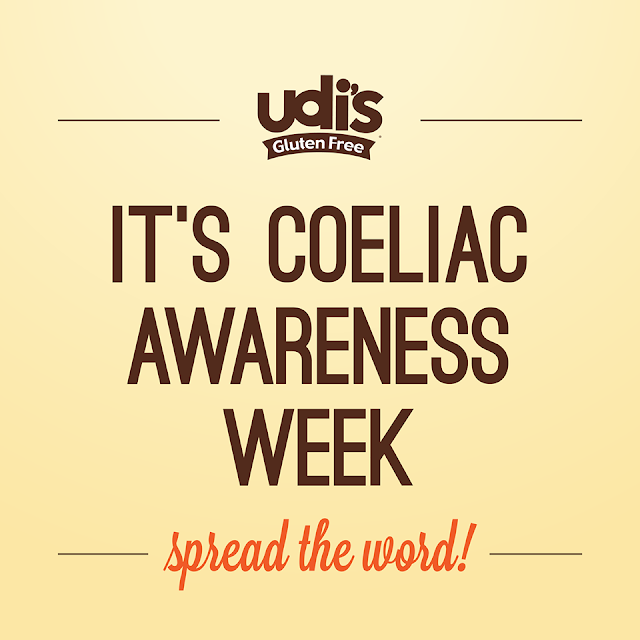 LONDON, 11 MAY 2015: New research out today, and in time for Coeliac Awareness Week, has revealed we’re still a nation that’s ignorant about intolerances despite over 1 in 5 of the UK thought to have a food allergy or intolerance. 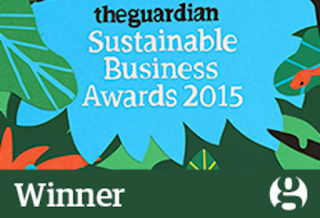 Divine Chocolate is delighted and proud to have won the Guardian Sustainable Business Award for Social Impact Innovation. The ceremony was held in Siemen's The Crystal at Royal Victoria Docks on April 29th. The awards were presented by The Guardian's Jo Confino, and other winners included IKEA (twice), Marks & Spencer, as well as Arthur Kay of Bio-Bean, and the Interface carpet company. The award was a recognition for the many and significant impacts owning Divine Chocolate has had on the lives of Kuapa Kokoo cocoa farmers - from community, farm, and education improvements to progressive programmes on women's empowerment, adult literacy, and model farm development. As well as empowering farmers and giving them a voice in the chocolate supply chain, Divine has also empowered chocolate lovers here in UK and increasingly around the world - giving them the opportunity to make change happen. 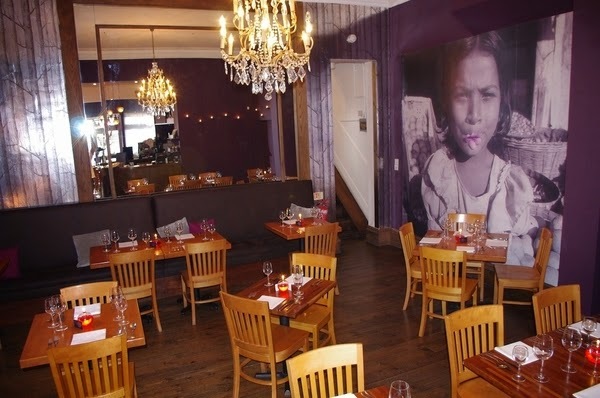 Brighton's award-winning Indian Summer restaurant is closing at 10.30pm on Sunday 24th May ... then relocating to larger premises at 70 East Street, Brighton BN1 1HQ and reopening on Thursday 28th May at 6pm. Following a £90,000 reinvestment and the creation of at least seven new jobs for kitchen, bar and front of house staff, the new, larger venue will seat c90 diners, half as many again as its current site. The existing restaurant is so popular, that in the summer months it has to turn away 100 people every weekend. On Valentine's night alone this year, 180 "walk ins" had to be denied a table. The number of people unable to book online must be considerably more. 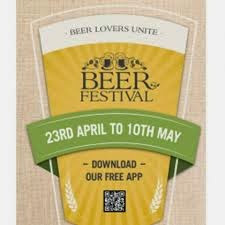 Until 10th May Nicholson’s pubs across the nation will play host to a beer festival, showcasing the very best in cask ales and speciality beers. With an unrivalled selection of 14 Golden Ales to match the increasingly golden days of summer, the Nicholson’s Beer Festival will offer something for everyone – whether you’re an IPA expert or appreciating an adventurous Blonde for the first time. By downloading the Nicholson’s Hop Circle app, the first pint is a welcome £1. Throughout the festival, there will be a unique opportunity to sample ales from Nicholson’s Grain to Glass competition, where a trio of British brewers were tasked with improvising ales from a ‘blind’ selection of ingredients. Varieties of ‘Style’, ‘ABV Range’ and ‘Hop Region’ were all selected at random, with the brewers relying on their creativity, experience and brewing know-how to create three innovative beers that will delight any inquisitive festival guest. Hubbed around The Star Inn the City restaurant, the latest venture from award-winning Star at Harome chef Andrew Pern, the unique ‘Treks in the City’ trail invites you to delve into the gourmet nooks and crannies of the ancient city like never before, with a peak at its best artisan food producers, and a chance to get your hands dirty making chocolate, baking bread and blending coffee. 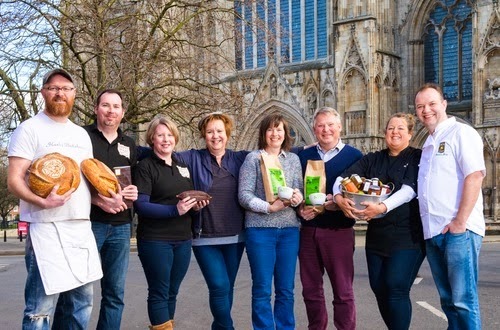 Organised in conjunction with Visit York, Yorkshire Food Finder’s metropolitan trail will allow you to eat behind the scenes of the city, with exclusive access to producers such as Guppy’s Chocolates and Puckett’s Pickles and hands on sessions at Haxby Bakehouse and York Coffee Emporium. 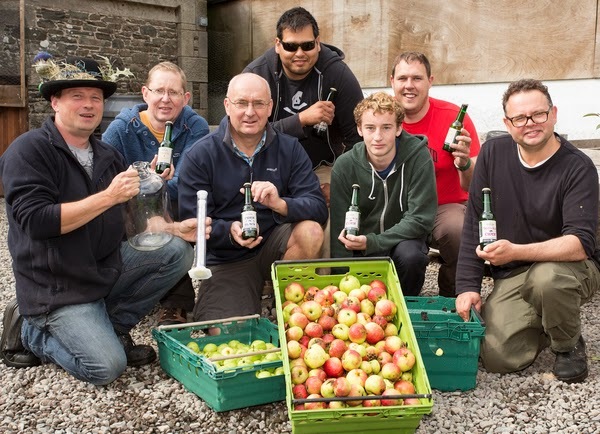 The trip will culminate in a fabulous feast at the Star Inn the City, using the produce seen in the day. Giggling Squid, the popular high growth family of Thai restaurants, has completed work on a new site in Billericay, Essex. For one night only, renowned cookbook writer and former head chef at Riverford Field Kitchen, Jane Baxter will be tantalising taste buds with a pop-up supper to celebrate the launch of this year's The Shops at Dartington Food Fair (24th – 25th May 2015). 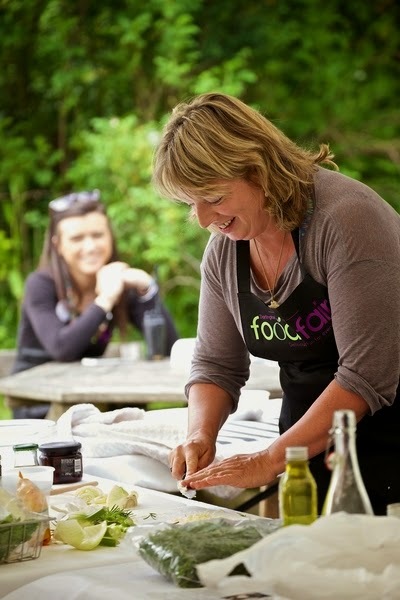 Set in The Shops at Dartington's enchanting courtyard, Jane will be wowing all with her culinary skills and preparing a delicious feast using locally sourced, seasonal produce. Marking the fifth birthday of the Food Fair, this delightful pop-up restaurant, a first for The Shops at Dartington will take place on Saturday 23rd May at 7pm. A classic combination, Tideford Organics' heavenly NEW Chicken Soup with Spring Vegetables is packed full of goodness. 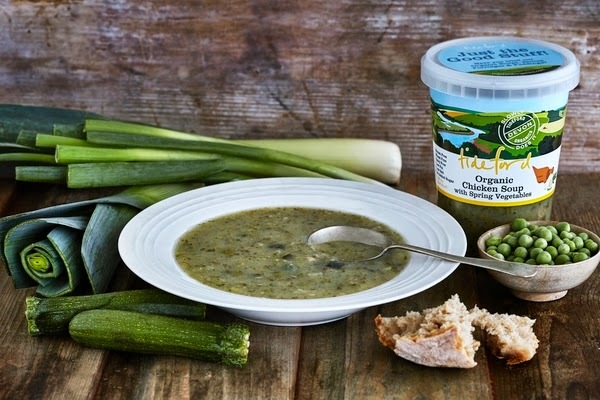 Using the best organic chicken, Tideford Organics has expertly combined flavoursome, fresh vegetables from the British kitchen garden including peas, leeks, courgettes, potatoes and spring onions to create an immensely tasty and nutritious, light soup. To finish, it's seasoned to perfection using garlic, crushed black pepper and spring herbs including mint and parsley. Lovingly produced in Devon, this Chicken Soup with Spring Vegetables is a British classic which tastes exactly like you'd make at home. It's a real crowd pleaser which is perfect for lunch, or a light evening meal. Tideford Organics is proud to only use organic vegetables, herbs and spices, which are all slowly cooked - resulting in truly heavenly flavours. Gluten, wheat and dairy free, it's suitable for coeliacs, is low in salt, low in fat and contains no added sugar. Making Life Easier for Slimmers Who Live Free-From! Foods You Can, a resource website for multiple food intolerance, allergies, lifestyle & health, is excited to announce that they now have Slimming World recipes on their website. The Foods You Can website has a variety of informative sections where you can compare foods, find places to eat, search for recipes and much more. A 'For-You-For-Me' Place For Super Dads This Father's Day! “If Carlsberg were to do” museums, well, this is pretty much what they would be like. Super-spacious rooms glittering with super-awesome pieces of Hollywood memorabilia from nearly a century of the world's biggest movies. Excitement from the Hollywood eye-candy is intensified by super-friendly servers bringing super-delicious refreshments to superbly-placed tables. 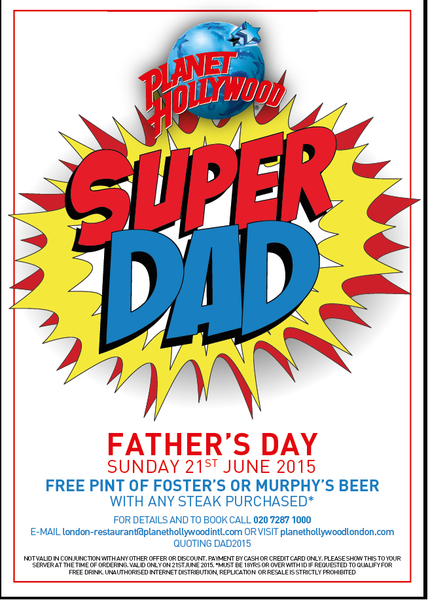 Planet Hollywood is what dads really want for Father's Day! The argument has finally been settled – residents of Oxford have been revealed as the nation's biggest pizza lovers, according to a new study. 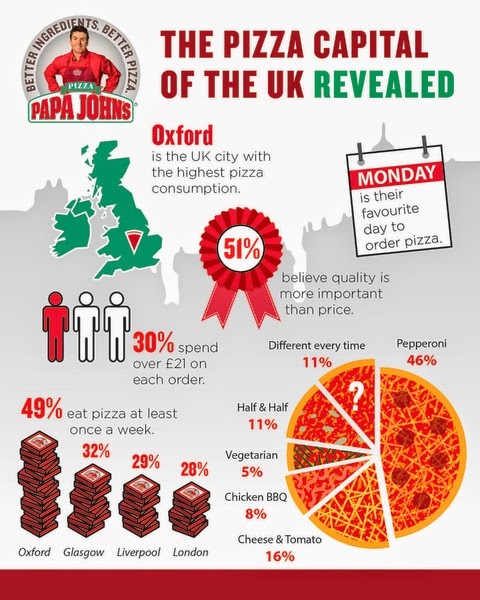 The surprising research from Papa John's into pizza eating habits has found that a staggering 49% of city natives* sampled eat at least one take-away pizza a week – with almost one third of people spending over £21 on every order, more than any other city in the UK. Unexpectedly, the results also uncovered that Oxford locals enjoy ordering pizza on a Monday more than any other day of the week. So Papa John's has decided to reward all pizza lovers in Oxford over the coming May Bank Holiday weekend by extending its Papa's 'Quality Guarantee' promise and declaring a 'Campaign for Better Pizza'.